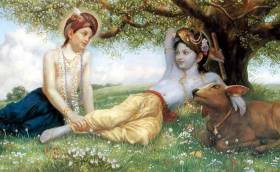 Vaikuntha Ekadashi is one of the biggest festivals celebrated at ISKCON Bangalore every year. Over one lakh devotees visit the temple on this auspicious day to have darshan of the Supreme Lord and seek His blessings. Of the various festivities held on this occasion, Vaikuntha dwara is a unique feature that distinguishes this from other festivals. Vaikuntha dwara signifies the doors of Vaikuntha, the spiritual abode of Lord Vishnu. At ISKCON Bangalore, preparations to set up Vaikuntha dwara at the northern entrance of the main temple hall begin well ahead of the festival. The elegantly crafted dwara, glittering in golden colour is a visual treat and a prominent part of the celebrations. Early morning on the day of the festival, the utsava Deities of Sri Sri Radha Krishnachandra adorned gorgeously in Lakshmi Narayana alankara are taken out in a royal procession towards the Vaikuntha dwara. As Their Lordships proceed gracefully to the accompaniment of sankirtan and traditional music of nadaswaram and drums, women devotees standing on either side of the procession route welcome Their Lordships with lamps and flowers. At the Vaikuntha dwara, Sri Lakshmi Narayana are seated on a pedestal. While this goes on behind closed curtains, the devotees assembled in front of the Vaikuntha dwara get an opportunity to hear a short talk by a senior devotee of the temple. The talk lasting for about 15 minutes will be on topics such as the significance of celebrating the festival, worshipping the Lord in His Deity form, chanting the holy names of the Lord, etc. When the talk ends, the nadaswaram band begins to play divine music and all the devotees eagerly look forward to having darshan of the Lord gracing the Vaikuntha dwara. As the nadaswaram reaches a crescendo, curtains open to the accompaniment of blowing of conches and ringing of bells and the entire atmosphere becomes spiritually surcharged. Devotees loudly chant “Govinda, Govinda”, and offer their obeisance upon having darshan of Sri Lakshmi Narayana, splendidly dressed and adorned with ornaments and colourful garlands of flowers, and seated on the Ananta Sesha. Devotees recite the Venkatesha stotram while an arati is performed to Their Lordships. This is followed by pushpanjali seva, which involves offering of flowers and chanting Sri Krishna Ashtottara, 108 names of Lord Krishna. The Vaikuntha dwara ceremony concludes with chamara seva to the accompaniment of a devotional song sung in a melodious tune by specially invited artistes for the pleasure of the Lord and His devotees. Soon, the combined sound vibrations of kirtan and nadaswaram fill the air. With the arrival of this most awaited moment, devotees joyfully pass through the Vaikuntha dwara, offering respects to the Lord of Vaikuntha and mother Lakshmi and seeking Their blessings. This is a special opportunity available only once in a year. This year, ISKCON Bangalore is celebrating Vaikuntha Ekadashi on Tuesday, December 18, 2018. The temple remains open for darshan from 8:00 a.m. to 11:00 p.m. without break. 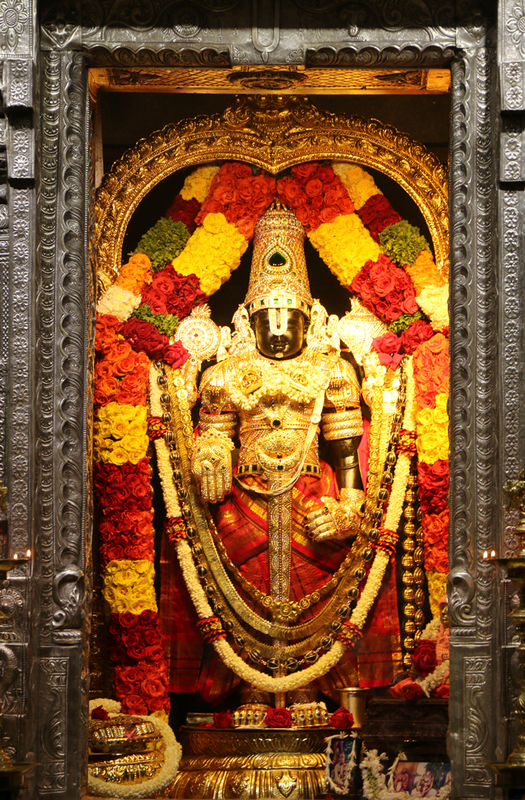 Visit our temple on this day to have special darshan of Sri Srinivasa Govinda and pass through the Vaikuntha dwara to receive the blessings of the Lord. Please remember to plan your visit preferably in the morning to avoid the rush so that you can have a quick and comfortable darshan.